Your plan does not provide access to our Reports feature. To add this feature, click on the Change Plan button below and select a plan where it is included. 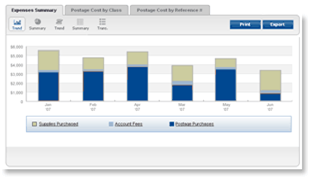 With Stamps.com’s reports you get pre-designed postage spending and usage reports to gain insights into your business. Analyze your data by cost type, location, user, mail class, or cost code. View your data as a bar chart to see historical trends, a pie chart to see a snapshot in time, or export it and use your own charts. If you want to the detail behind the numbers you can easily drill down with just one click. Your plan does not allow the use of SCAN forms. To add this feature, click on the Change Plan button below and select a plan where it is included. The Shipment Confirmation Acceptance Notice (SCAN) form ensures that your packages are scanned by the USPS when they are received so that your customer can feel confident that their package is on its way. Using Stamps.com you’ll be able to create a SCAN form with a single click. Then just hand the form to the clerk or mail carrier and they will scan the barcode on the form. This scan records an Acceptance event for all the packages associated with the form, without having to scan each package individually. Please contact your administrator to add funds. Thank you. We have sent the username associated with your email address in an email to you. Once you receive your username you can sign in to Stamps.com. You are now required to change your temporary password. Be greater than 6 characters in length. Not be the same as your username. Not be the same as a previously-used password. To protect your account, you must provide security questions and answers before logging in. Click "Continue" to be redirected to a new page to set up your security questions and answers.